How’s your October Unprocessed challenge going? This is my second year going clean for the month of October, and I see why this is really a lifestyle change instead of a simple diet or weight loss challenge. The more you employ small changes into your daily routines and everyday meals, the more an Unprocessed challenge won’t feel like such a challenge. Obviously, living unprocessed is harder than it looks. It’s a great month-long challenge simply because it’s kind of hard to stick with. But making really small changes every day can help you eat clean the other 11 months of the year. 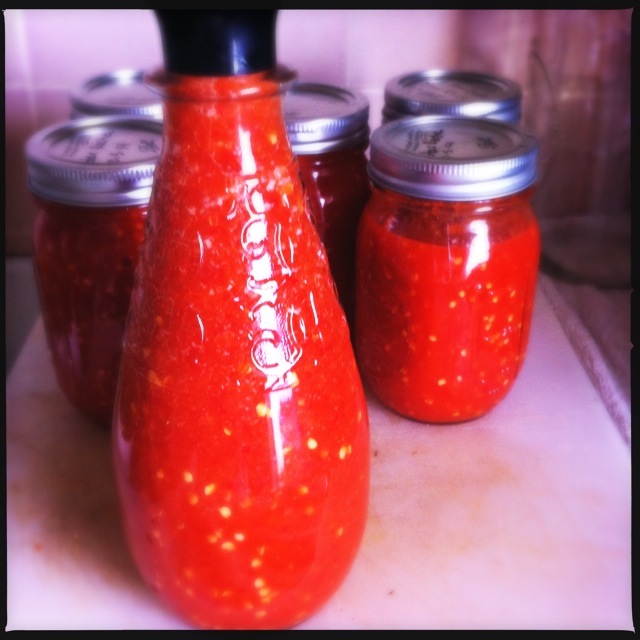 Often, condiments and sauces are some of the first things people ask me about when I tell them about the Unprocessed challenge, but those sauces are some of the easiest things to make from scratch — and to leave out all of the mono-whatdjacallit sodium-hydrox-o-OMG. Seriously, read the label of the bottles in your fridge sometime. Most of them start with simple ingredients (salt, vinegar, tomatoes, etc. ), and them all of a sudden, it goes off the rails with additives and stuff you can’t pronounce. The solution is simple: Give up the labels and make your own. It’s very simple to make fresher, tastier, healthier versions of most of the condiments in your refrigerator right now. For the cost of a bottle of BBQ sauce laden with corn syrup, or mass-produced sriracha, or preservative- and dye-packed ketchup, or fake mustard, you can make a far better, healthier, tastier, cleaner version at home. 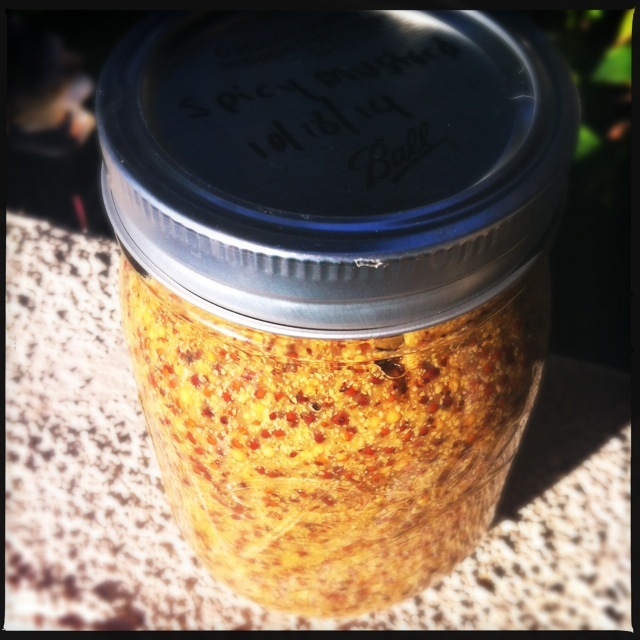 … I used the liquid to soak a bunch of mustard seeds for a spicy homemade mustard. 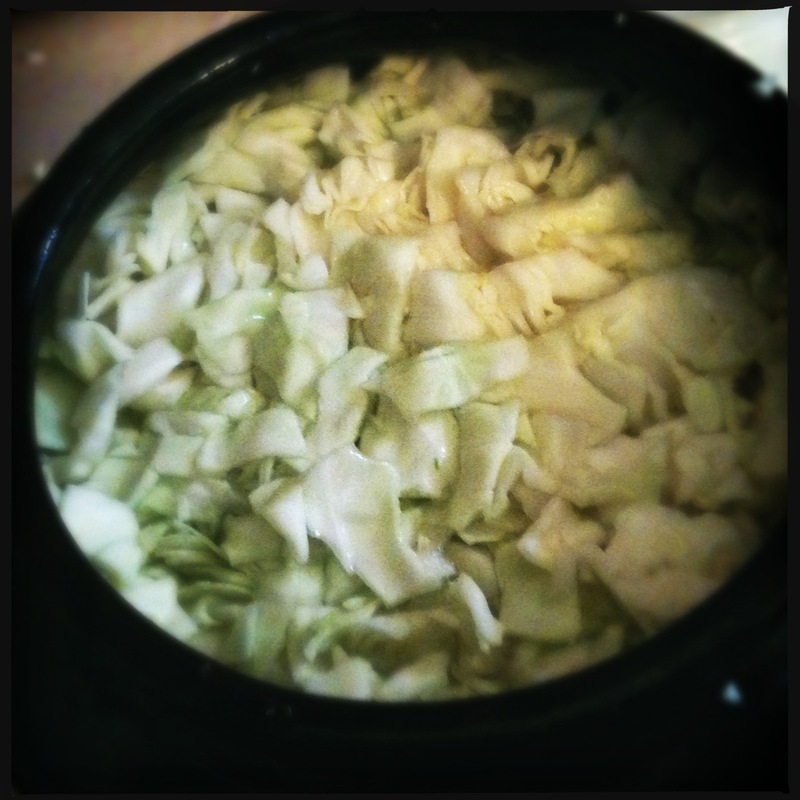 And have you ever tried store-bought sauerkraut? If you have, you probably hate kraut now, just on principle. 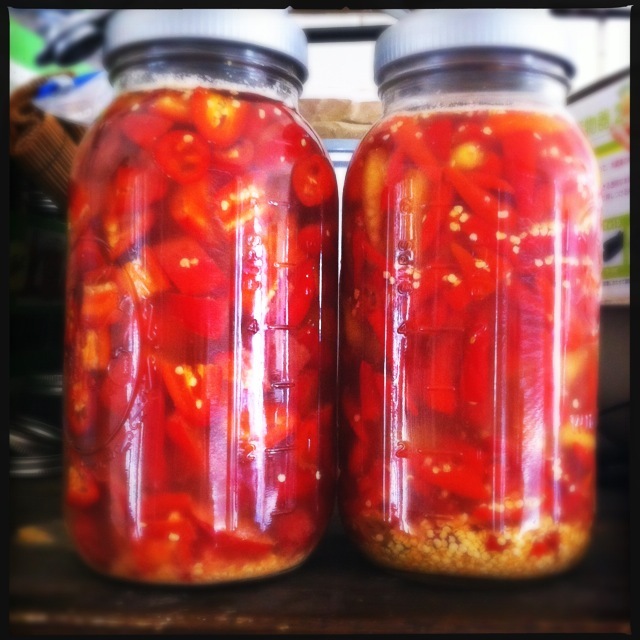 Grab a jar or a nice chemical-free crock, and try making your own probiotics for a great project and a delicious and healthy nosh. Lots of paleo recipe sites like this one have great ideas for replacing pasta with “zoodles,” or zucchini noodles. They’re easy to make and lots of fun, particularly if you have kids and need help getting them to eat properly. 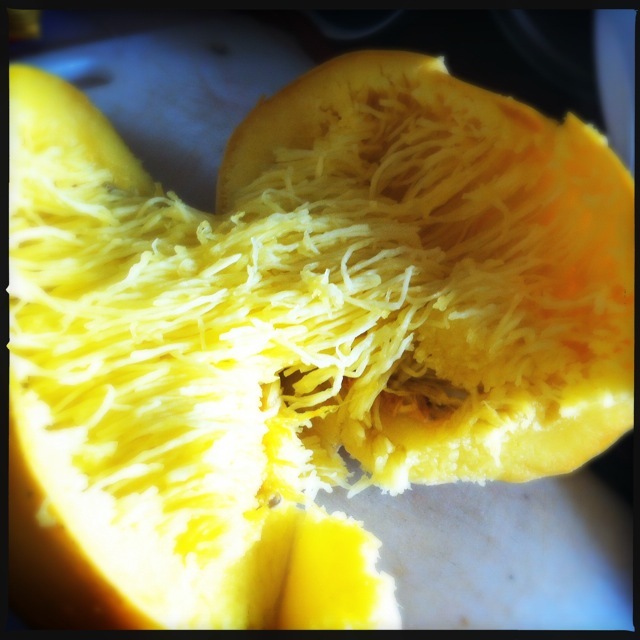 Personally, I am a huge fan of spaghetti squash. It’s very simple to prepare; you can steam it my stabbing it with a few holes and either microwaving it (for about 2-3 minutes per pound) or slow-cooking it (4-6 hours on low setting, covered halfway with water), then using a fork to pull off all of the stringy bits, then mix it with your favorite sauce or pasta topping. You can also cut it in half when it’s raw (you’ll need a wicked sharp knife) and roast it for the same effect. No matter how you prepare it, a medium-sized squash will give up enough stringy strands for at least 3-4 servings. I love to replace hamburger patties with the big, hearty mushrooms, or just grill them with a little oil-and-vinegar salad dressing and serve as a side dish or vegetarian entrée option. No one will miss the meat when you grill up these babies. Eating Rules also has a great Portobello recipe this month. Homemade bacon is beyond compare. It’s stupid easy to make, and the homemade version is far better than any store-bought, nitrate-packed, pink slime. I take a nicely trimmed pork belly (my local Korean grocer does it perfectly and doesn’t look at you curiously when you request pork bellies), put it in a freezer bag with 2:1 ratio of kosher salt and brown sugar, then let it sit refrigerated for 3-4 days. When the meat is tough to the touch, it’s ready. Rinse the meat, leave it in the fridge overnight without a cover, and smoke it for 3-6 hours, or until the internal temp is 160. That’s it. It’s unprocessed. It’s nitrate-free, it’s super-easy to make, and it’s f***ing delicious. 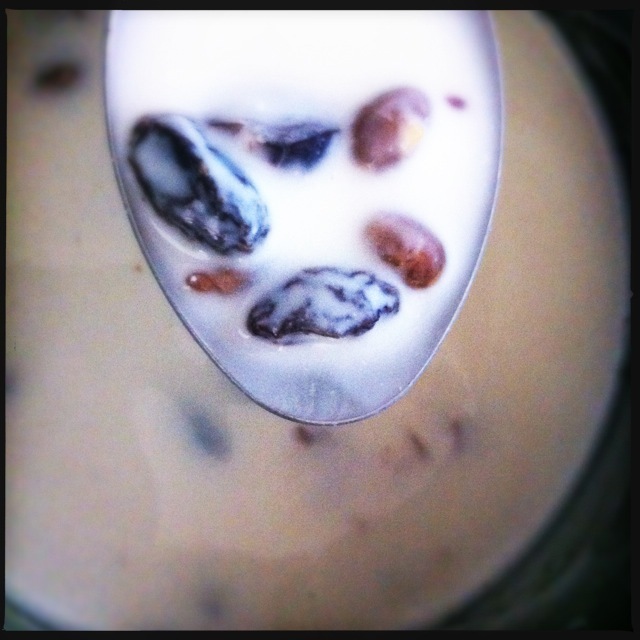 Speaking of things that are easy to make, and the homemade versions far surpass the store-bought … my yogurt make is one of the best purchases I’ve made this year. You only need a bit of yogurt starter and some good milk, and the machine does the rest. I just make plain yogurt, then add organic honey or homemade jam. 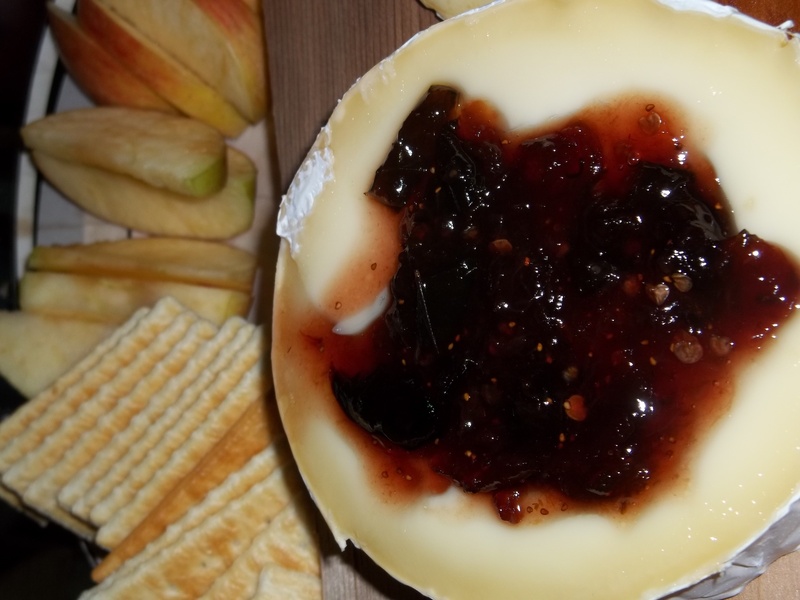 Bonus if you add some of this chow-chow from Friend in Cheeses Jam Company … it’s amazing! It’s all delicious and organic, and still unprocessed. And don’t forget, the idea is to control the ingredients. Think about other every day meals you can make from scratch instead of purchasing processed. Cooking seasonally and locally usually means you’re eating the best, and no matter what you get in your weekly delivery, a recipe for it is only a Google search away. 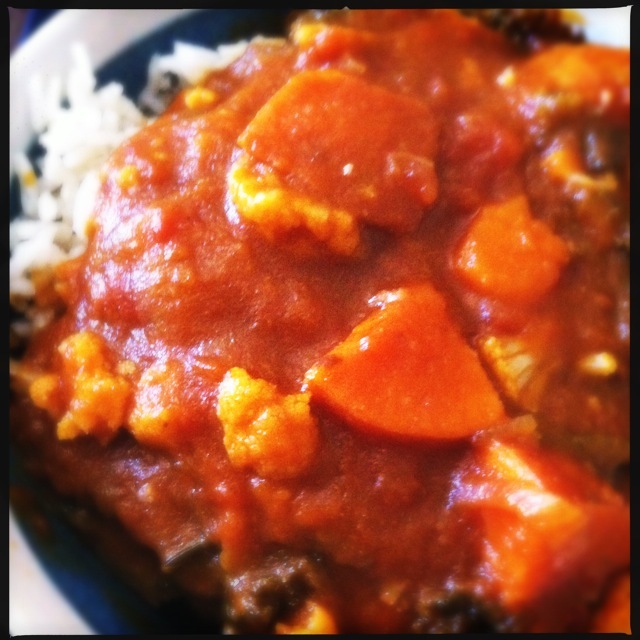 And when in doubt … CURRY. This is my favorite recipe for pumpkin curry, but you can literally replace the vegetables with anything. I did the same recipe with cauliflower. Yum. Lastly, don’t forget to use all of your gadgets! If you’re concerned about added fats, oils, and greases, you can’t go wrong with the clean taste of outdoor cooking and smoking. 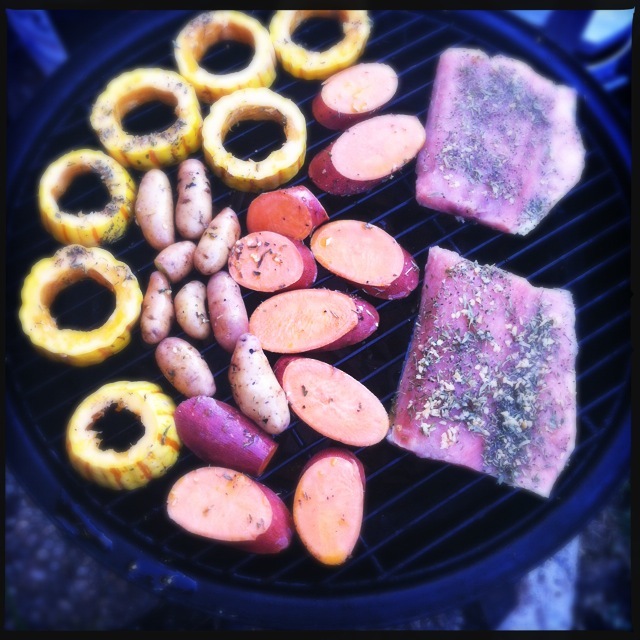 I used my outdoor smoker to pretty quickly (less than an hour) smoke a couple of pieces of salmon, plus some yams, fingerling potatoes and sliced delicata squash. A little olive oil, a few herbs, and you have a delicious unprocessed dinner in no time. Planking? Not the weird fad that consists of kids lying face-down in a public place or other location, I mean cedar planking. As in cooking on a cedar plank, indoors or out. It’s a classy and modern yet ancient and earthy way to make tasty food taste even better. Oooh, it smells like fall around here. The weather took a sharp turn towards the weird in good old San Diego after Labor Day weekend, and the smell of the slightly rainy and humid feel makes me think of forests in the Pacific Northwest that are brimming with fragrant woods. Indigenous people have been cooking their meals on woods like cedar for generations. I received an awesome gift of some fresh Alaskan salmon, so I figured this was the perfect time to try some planking on my M7P outdoor cooking system. I did a little research beforehand, looking at the tips from the manufacturer (I used “TrueFire” planks but there are a few different places to get cedar specifically prepared for grilling and cooking) and asking some fellow foodies in the know. The main recommendations I got were to soak, soak, soak the planks. The ones I bought suggested 20 minutes to 4 hours of soaking, but pretty much everyone else I talked to suggested more like 6 hours and even overnight. Since this blog is about my experiments, I determined that I would … well, experiment … and discover which recipes and methods work best. 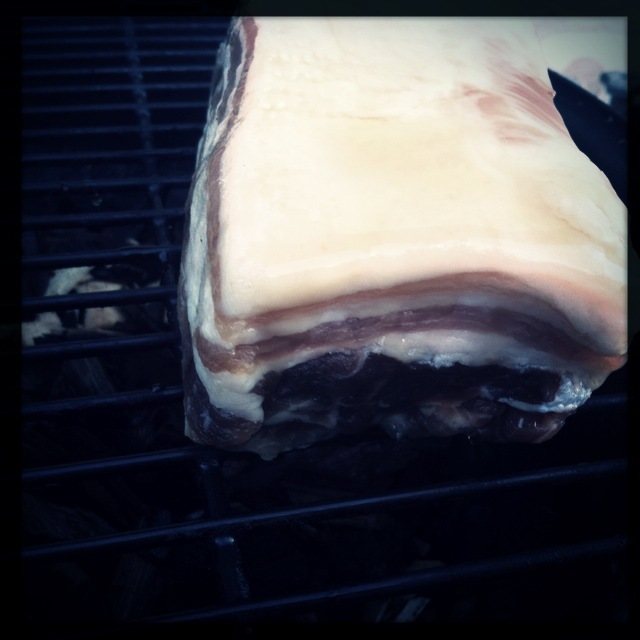 I made this recipe on a cedar plank that had been soaking in water for about 4-5 hours, and I cooked it over charcoal. Obviously you can adapt this recipe and soak the plank in other liquid, like fruit juice or wine (but stay clear of spirits because they will make your plank of cedar into a plank of fire). Carefully place the salmon on the planks (you may need one plank per fillet if the planks are small or the fish is big) and season the salmon with the salt, pepper, and herbs, and sprinkle fresh juice from the lemon on top. Add fresh vegetables (I used asparagus, but stick to something like broccoli that would steam quickly and easily) and cover with foil. 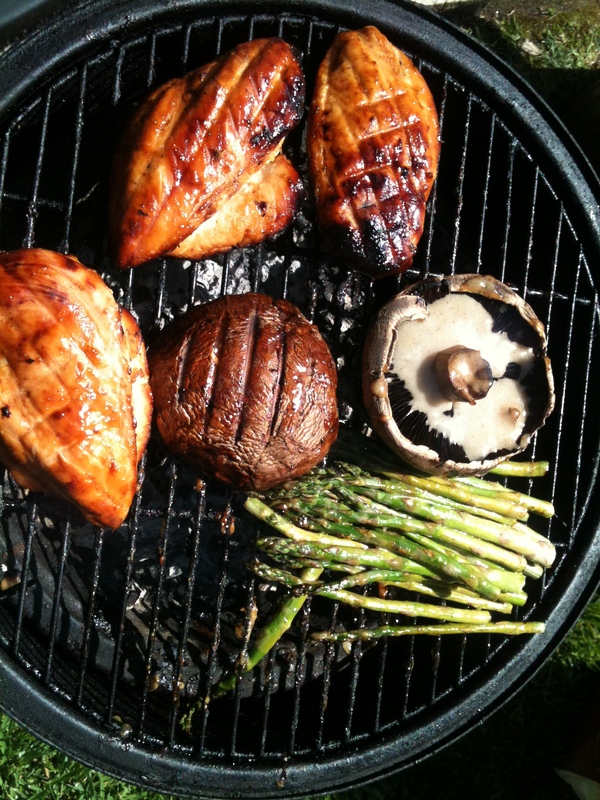 Carefully place the plank on a preheated grill and cook for about 25-30 minutes. The vegetables covering the salmon also help to keep the heat inside. Cedar is weak. Within 10 minutes at not-very-high heat, the plank has started to buckle in on itself and the juices are starting to run off. The solution: put the plank on a broiler pan or some other equally sturdy and hole-y flat surface. Temperature control is key. Keep the fire at about 200 degrees and keep the lid on as much as possible while cooking. 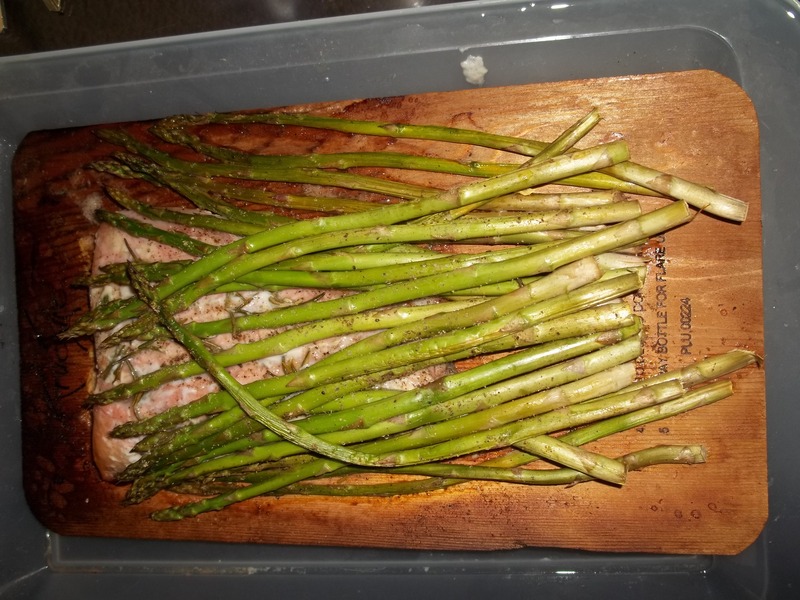 The wet cedar is also steaming the salmon and vegetables, and it helps to keep the salmon protected by a pile of asparagus or other veggie. It’s also recommended that you keep a squirt bottle handy in case of a flare-up. A broiler pan is perfect to keep the cedar plank from buckling. I got some lovely fresh vanilla beans and thought the additional sweetness and citrus flavor would be great on the salmon. This version is also baked in the oven on top of a plank soaked in orange juice, but it can be cooked on a grill also if you like. To make the marmalade, slice the grapefruit very thinly, peel and all, into a nonreactive pot (to make the marmalade less bitter, omit the peel but keep the pith). Add vanilla and sugar, boil on high for about 10 minutes and then reduce to a simmer for about 30 minutes or until the mixture has gelled (watch carefully, because when it’s done, you have about 10 seconds to remove it from the heat before it burns). 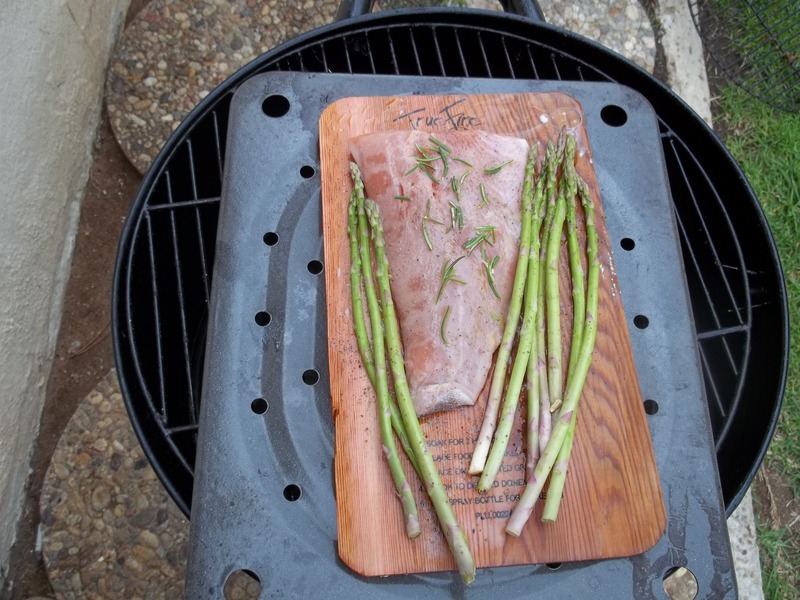 While still warm, spoon on top of salmon fillets that are already on soaked cedar planks. 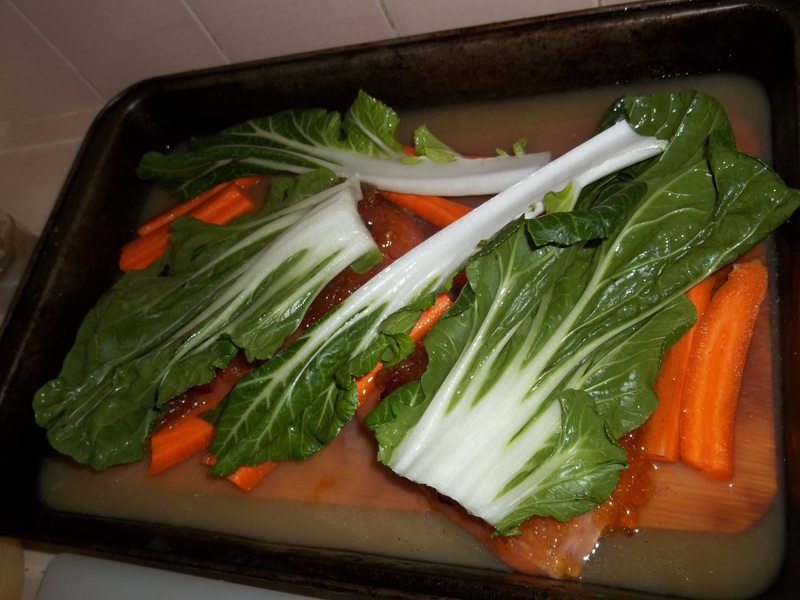 I kept the cedar as wet as possible (literally in an inch of orange juice in the baking dish) and also covered the salmon with sturdy vegetables to keep the moisture and heat inside while baking. Cedar takes the flavor you give it. 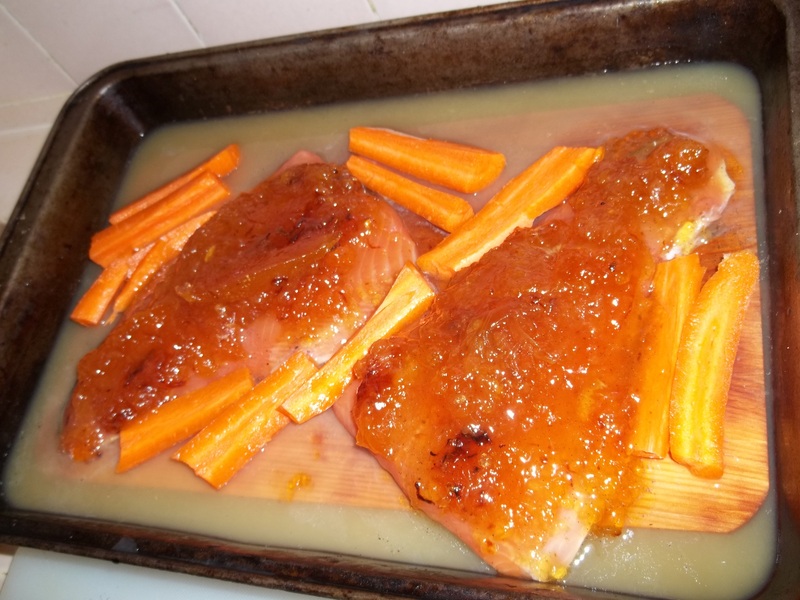 Soaking the plank in orange juice adds a ton of fresh and delicious flavor to the delicate salmon. Cedar is delicious. There is no need to pile on overpowering flavors to compete with the delicate flavor of the salmon. Although the grapefruit is a little overpowering in this recipe, salmon and most other fish work very well with citrus and this is no exception. Baking the cedar plank while it’s immersed in liquid means you don’t need to be constantly vigilant about the cedar possibly flaring up, so it’s more convenient in that sense. However the cedar flavor is definitely more pronounced when the plank is grilled. Of course, there’s no reason your cedar-plank-cooking experience must be limited to vegetables and delicate fish. For my next attempt, I went full turophile. I love cheese like Paula Deen loves butter. I soaked this cedar plank in white wine to enhance the awesome. For serving: a jar of your favorite spicy jelly and some crusty bread or crackers (I used my favorite roasted cherry/pepper jam. Thank goodness I had an extra jar! 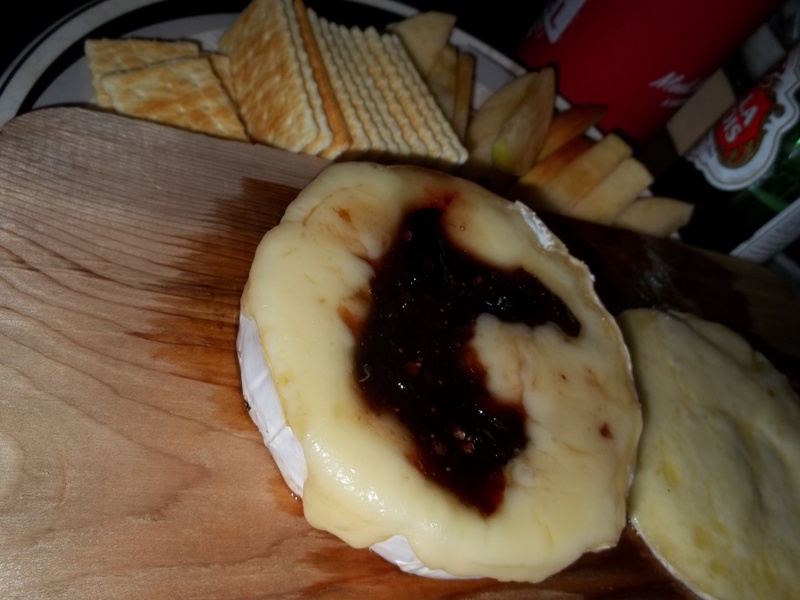 It’s delicious and smoky and is an excellent addition to the creamy brie). Soak the plank in the white wine for at least 4 hours (to really get the wine flavor into that plank, soak it for 6 or more). 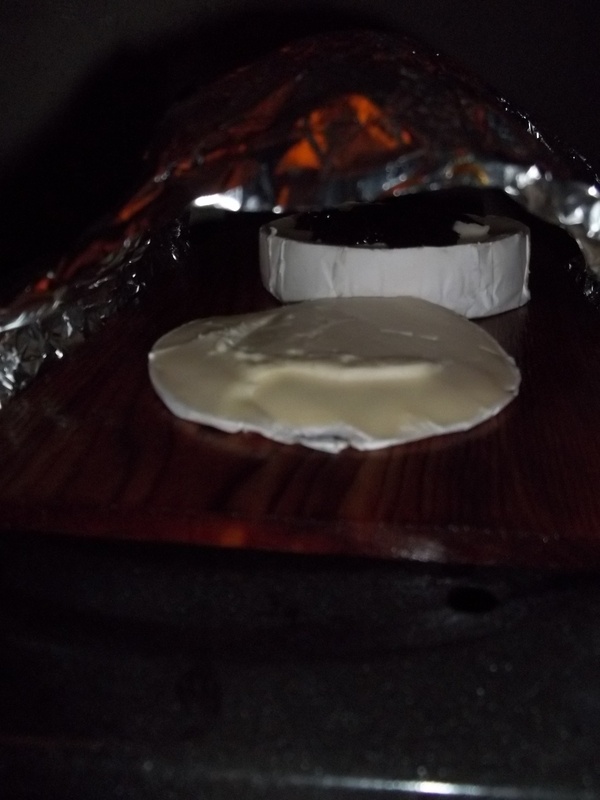 Carefully slice the top off of the brie package and place on the plank, then carefully place on a grill. Cover and let cook over the hot coals for about 20 minutes, until the cheese is gooey and bubbly. For serving, add the spicy jelly on top and serve with sliced apples and pears and crackers or bread. Try it with a spicy and fruity jam or preserve. Cheese is awesome. Well … I may have known that before. White wine doesn’t add as much flavor as I thought it would. The wine adds a delicate scent and flavor but the cedar is pretty delicate and fragrant as well. One day I plan to try planking some chicken and cheese with a good hoppy beer. If you are cooking on coals, cook as the coals are starting to cool off. If you have a propane or very hot grill that has been cooking all day and is still very hot, make sure you keep an eye on the brie because you have about enough time as it takes to slice an apple or two and open a pack of crackers before the cheese overflows all over the plank. If the grill is cooling off when you place the brie on it, you have a beer or two before it’s soft enough to serve. But still keep an eye on it. It also helps to "tent" some foil over the plank, like so. Brie is like jam in that when it’s done, you have about 45 seconds between “done” and “burnt beyond recognition and unusable as food.” Watch it carefully or you’ll waste the cheese and the cedar plank. Altogether, I am very happy with the results of my cooking on cedar planks. It adds a delicate and smooth yet very distinct flavor to several different dishes. Obviously things like delicate salmon or gooey brie is best for a medium like cedar, but I look forward to planking chicken, ribs and even desserts. Stay tuned.